Stock Market Crash Round Two? 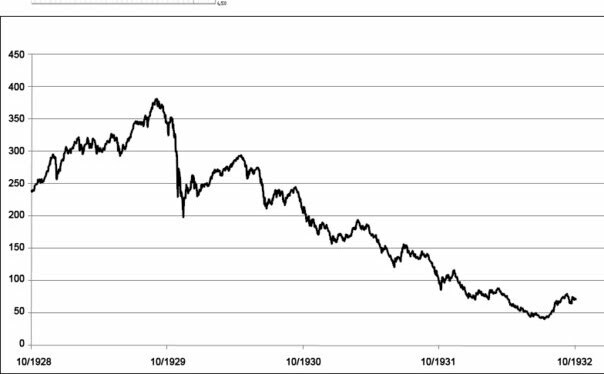 At the bottom of this post I compare the chart of the 1929 crash and rebound to the 2008 crash and this rebound. So, the US equities markets have rallied tremendously off the March lows as fear quickly turned to greed. I mean what else really justifies such an optimistic view of US economic and corporate performance going forward. Housing has been in a recession? depression since 2005. What has enabled the consumer to spend for the last 20 odd years? That's right rising home prices. But hey government is committed to softening the fallout. So we get flat growth probably instead of total chaos in housing and the economy. For atleast 2 years people have been calling for a bottom in housing and real estate in the US. It hasn't come. Is it really any surprise when even today big banks are still dumping residential for fractions on the dollar? Acres of land in Charlotte that once sold for over $2 million dumped for $300,000? This bubble hasn't fully popped I don't think. I live in Charlotte North Carolina and housing is as bad as ever if not even worse I think. This state like many other states are in bad financial condition. North Carolina is desperate for tax revenues. So desperate not that many months ago they were going to pass a bill to tax online transactions. The kind of affiliate revenue Amazon offers to webmasters who use Amazon links on their sites. I used to use Amazon affiliate links. Not anymore because Amazon ceased doing business in all of North Carolina even before they could get the tax in place. I made a brief thesis that the market seemed out of whack with even best case recovery over the future. This is not just another little recession. The economy is not going to blast to new heights any time soon. Forward valuations look more like a regular old recession is about to end I feel. The consumer is different now. The consumer is saving more now and deleveraging the last 15-20 years of insanity. This could take some time I believe. The question I have been asking myself is just how long can the government spending and low rates continue to have a positive effect on the economy without bankrupting us in the long-term if it is not to late already. Could the FED and government stimulus actually work? They certainly had an effect in the past. But just how bad is the recession/depression? It's not easily overcome right? Could I be wrong? Yeah. Is this a hard view to still hang on to after the market run? Yes and no. No, because I'm usually a skeptic and pretty cynical even for my age. These viewpoints be it fortunate or unfortunate turn out to be right a lot especially in the world of investments and economics. On the other token questioning the soundness of this recovery? and historical stock market recovery has definitely made me hesitant to make some trades even though I had to dismiss the fundamentals to be long biased since around April or May. The technical picture was pretty sound especially after the attempts to correct failed and the market kept breaking to new highs. 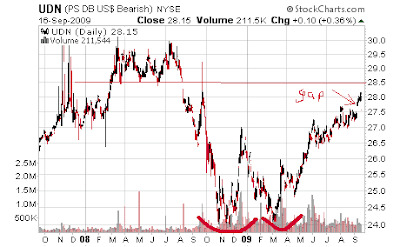 I'll be a perma-bull as soon as housing shows a clear bottom. The question I have here now that the Dubai bubble is fully bursting is how safe is China and Asia's real estate sector? On valuation alone Chinese equities don't seem like a bubble to me atleast comparable to 2007. However, banks are a big, big part of the Shanghai Composite. This could be devastating if their banks are leveraged. Of course real-estate in China would have to collapse. I don't follow China that closely to know if there are bubble conditions in real-estate there. Maybe someone reading this could point me to a fairly reputable source if they know more on this. I think it would be hard, for me atleast to make a call on housing or real estate in China because it's harder for me to gauge a bubble vs equities and considering they actually do have a seemingly healthy economy and rapid population growth. Indices are encountering some trend line resistance. If the next wave or healthy consolidation is to come it will possibly be very soon. These might be two of the scariest charts right now. There is a very similar spike/pipe bottom that happened in the 1929 bottom and uncanny resemblance in the bounces. Even on the rebound percentages from bottom. That's 1929 on top and 2008-09 on bottom. And notice the failed signal we had in June and July were the market rally looked like it was going to end but just continued upward. Whether or not such a rapid decline will come so fast I think at the very least a short pull-back is in the works. 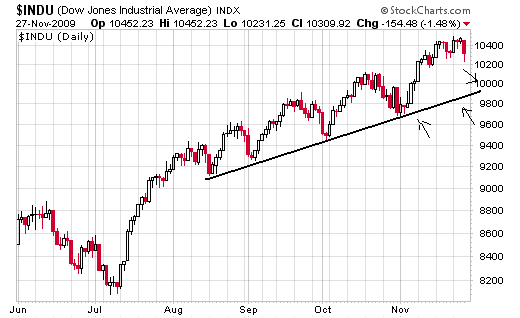 This support trend line will have to be tested again. I wouldn't be surprised to see some window dressing by institutions as they try and lock in these yearly gains. 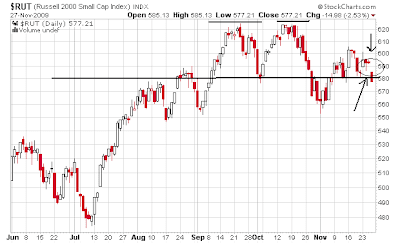 Not a good technical picture on the Russell 2000 small-cap index. This gap down from the Dubai news spooked the market or atleast gave good enough reason to sell. Such a gap at these levels does not look good for the time being. I've been watching this bull-trap play out in financials since it happened. The possibility of it playing out fully and the financials breaking down is looking very high here now with this gap down and shooting star day. I was looking at Boss Holdings BSHI.ob a couple different times over the past year and a half or so. The stock continued to trade very thin and decline. I just found out that back in late August they announced they were going to go private and cash out holders of less than 100 shares at $7.65. I think this may already be finished. I don't know. 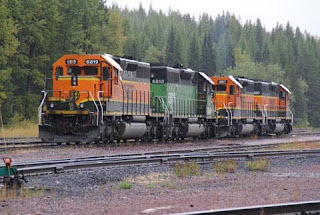 So, I imagine everyone knows Warren Buffett bought Burlington Northern recently and the media has spun it as wholly positive and a bullish bet on the economy of the United States. I'm going to look at this in a different angle and in a more skeptical and realistic fashion. Buffett says,"I basically believe this country will prosper and you’ll have more people moving more goods 10 and 20 and 30 years from now, and the rails should benefit. It’s a bet on the country, basically." The media spin on it however is it's a bullish bet on the economy. I think it is a bet on future trends. None of them on a stronger United States economy. It just looks more like a bet on commodities, the fact that the dollar will be very weak, that people will be alive and eating in the future, the fact that oil prices will sky rocket over coming decades and that Canada will probably be stronger than the United States economically. What is the way to ship if oil exceeds $140 a barrel? It sure isn't trucks or planes. The fact that rails take away from them doesn't seem particularly good, just that they will. This may be a bit of a stretch but buying a railroad seems more like a doomsday economic hedge than a hope that the economy will be strong. Shipping coal and necessities is pretty much a given. And you can't ignore a healthy demand from Canada next door. Where's the leveraged bet on the consumer? Are you telling me from the extremely low valuations from the biggest stock market crash of his career and the worst economic crisis since the early 1900s that Buffett couldn't find a company any more correlated to the consumer? This is supposed to be an "all-in" bet right? Remember the consumer is the U.S. economy with consumer spending comprising over 70% of GDP. If the consumer does well so will the economy. And this railroad is the best deal he could find to "bet" on the economy? Give me a break media. A bet on the economy is buying a company related to the housing industry or a service company. I heard Buffett say he thinks this country will prosper in the future. Prosper isn't that strong a word though really. Buffett is an extremely candid guy to say the least. Why wouldn't he have said do extremely well or better than ever. He was saying this in the heart of the panic of 2008 and 2009 but I think one has to be skeptical of the context of those statements possibly because he is one of the most important statesman. 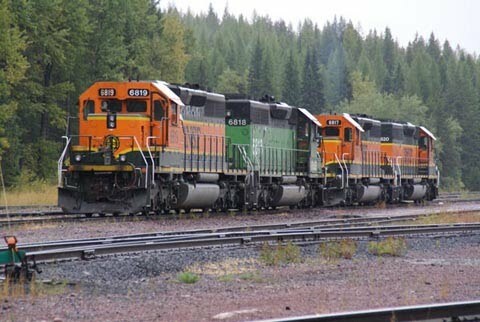 A low dollar and high fuel prices makes railroads an alternative for shipping to Canada and across the country. In that case it is a strong bet on Canada's economic future. I think that Canada will possibly be doing better than the US because they have the oil, healthier banks and financial institutions and more stable currency. Emerson Radio MSN is still doing very well and just reported second quarter results which were pretty good from looking over the press release. Quarterly revenue wasn't that great but overall on the year they are doing well. The stock only has a market cap of about $50 million and being a small-cap this size there probably isn't a line of institutions ready to pile on. I think it could continue to trade higher slowly though as it has all year. In the next couple days though I think it could pull-back toward the upper bollinger band like it did after the last huge pop. I was not 100% sure that the top was in in that last post a couple hours ago. I'm leaning much more toward the highs are over now and we've seen the top. I don't think we see new highs anytime this year probably going off what's happening now. I just have to be bearish now. The Russell 2000 small cap index has cracked support. The uptrend is over. Remember we cracked in July on the major indices and I called it a bear trap which it was and got bullish on the indices. That was a powerful signal. Here are small-caps. For the countries sake I hope they can find some support soon and we trade sideways for some months but this just doesn't look good at all. Another thing is Shanghai cooled off a long time ago. I guess they will lead us again. EEM is more broad but jeez this kind of sell-off on that kind of volume usually doesn't end well. This is very bad. Emerging Market ETFs EEM EDZ EDC are at the top of my watchlist. These are some of the most volatile 3 X ETF's right now and I think this will continue for awhile. The bounces should be volatile too. This runs uptrend is still intact but we are getting very close to possibly seeing some potentially dangerous conditions play out. The bull trap I pointed out on financials is not very reassuring when you take what could happen here in the next couple days. I just noticed some hammers at the bottoms of the last pull-backs. Bulls will want to see some big hammers soon. There should be a bounce or atleast an attempt to pick up some stocks at this level I circled on the Naz. If not look out! If the Nasdaq closes for a couple days below this support line the rally from the March lows is over. The momentum will be over. How much more downside could play out? I don't know. We could test the March lows or just go sideways. I'd be more inclined towards sideways or slightly down but all this is getting ahead of the next couple days. These next few days are very important. There could still be a new high soon if the support is broken but that doesn't seem very likely to me with the current economic and fundamental indicators today. Uptrend still intact. Bigger selling pressure today. The bounce could be huge or the attempt could just get slaughtered. I expect some sort of bounce tomorrow. Nyer Medical NYER is planning to liquidate after they sell their pharmacies for around $19 million. NYER was a chronic net-net for a long time I looked at a couple years ago. They've only got $5 million in cash on their last balance sheet. Let's say they get the full $19 million that's about $24 mil in cash less a whopping $10 million in total debt. This is assuming nothing changed from the filing date. The $7.5 mil market cap doesn't seem like much of a spread. They do have $6 mil in receivables. I think a conservative crunch would put liquidation value around $10-12 million but this is just a really quick back of envelope. I don't think the stock even traded that high. It only got to 2.45 or about $9 mil. I don't think I'll be playing this right now but some of you all might want to do some more research and number crunching. It seems like there could be a 15% or so spread there. The price action is sort of weird for a liquidation news. It opened up the day trading over $2 a share and hit a high of $2.40's per share then steadily sold off all day and closed at 1.86. I imagine the selling pressure was from bitter bag-holders who bought in over the past few years and were happy to dump their shares with the stock up over 100% on the day. That is just market forces based on past price action aka technical analysis. I did some TA on the financials with XLF a few days ago. This turned out to be the right read as far as the further breakdown coming. My timing was a a couple days off because I was holding that trade as if the VIX was still over 50. I think this move will probably get a retest of some support if not turn into a short-term major top. That's a possible double top with a failed signal forming if this move prints 13.50. No reason to get ahead though but I am just keeping an eye on that if it happens. 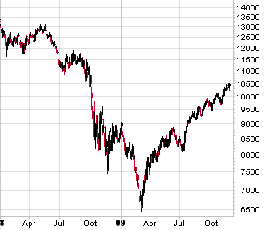 I think this down-slide the past couple days might have caught some people off guard after that rebound three days ago...or maybe they're just getting in the Nasdaq leaders. I'm shorting financials over night. I'm long FAZ at 19.85. I had thought about shorting as soon as they filled the gap about two days ago but it didn't seem safe enough then. Financial stocks look like toast here. We've got a bear trap. A really ugly bear trap. A break of support and a shooting star here as it looks like everybody hit the panic sell button or either program trades triggered. When it cracked that support around 15.00s there was a pretty big move and no flag. That's why I feel pretty good holding overnight. I'm not trying to get much more out of it. I should be selling tomorrow if there is anymore weakness. The maximum potential downside for XLF is 14ish though. I like this set-up. I posted on Peerless Systems PRLS really quickly on Thursday after glancing over a couple things. I just wanted to get it out there quickly for whoever might have been interested. Looking more closely there are some more good things here along with the stability in cash. Activist investor Timothy Brog who I had the pleasure of speaking with briefly has gotten on the board of directors as chairman. No doubt, the company is now moving in a better direction. In 2008 they sold about all of their intellectual property to Kyocera-Mita Corporation for a pre-tax gain of $32.9 million along with 38 employees. They have a lot of cash to work with to get value out of the company be it an acquisition or some other means. There definitely looks like there is upside to the stock. "The technology we license has addressed the worldwide market for printers (21-69 pages per minute) and multifunction printers (“MFP”) (21-110 pages per minute). This market has been consolidating, and the demand for the technology offered by us declined throughout fiscal years 2009 and 2008. The document imaging industry has changed. Lower cost of development and production overseas increasing complexity of imaging requirements has resulted in us not being able to effectively compete in this environment. As a result, we sold our intellectual property and transferred 38 of our engineers and support personnel to KMC. Although as a part of the transaction we have retained the right, subject to certain restrictions, to continue licensing and supporting the imaging technology that we had previously developed and to continue to license third party imaging technologies. We are currently pursuing other potential investment opportunities. The strategy calls for aligning our cost structure with our current and projected revenue streams, maximizing the value of our licensed back technologies and expanding our business through investment opportunities. Our contract with Adobe expires on March 31, 2010. We have had discussions with them to either extend the contract or enter into a different agreement with them. Our discussions have not resulted in an agreement. In order to maximize the value of our Intellectual Property and relationships with our clients, we are exploring how to transition our customer base that currently utilizes Adobe technology to another technology provider." Time To Buy Crude Oil? I was watching crude oil over the last couple weeks but this last week I got distracted with some other stocks like my QDEL buy and I missed the easy oil trade. I wasn't watching for a breakout. Let's go back a second. Well, a week or two ago I saw the same exact pattern forming in oil. Fundamentally oil and gold rise because of inflation. On this chart below I was expecting heavy volume to come on the first move before a breakout. It wasn't there. Usually when a triangle pops it is on volume like gold was. There were two hammers back to back leading right up to the breakout though that I missed. There actually is a triangle that this move has come off of just not the long one I was expecting. For the very long-term it's a good idea especially on major dips. But holding oil contracts outright vs ETFs is better. For holding for months at a time the etf USL should track oil better vs USO because of the contracts. USO has underperformed oil because it holds short-term contracts. USL holds 12 month futures contracts. I doubt there is that much short-term upside left on this move but I wouldn't be surprised to see a couple more days before some consolidation. I'm not sure I will put a position on on another breakout because I play oil with ETFs like the double long DXO and I want to see a lot of clear upside that I can swing trade. Maybe I'll take a stab if bigger volume comes here this week. I guess everybody knows this week is a big earnings week. Just to keep the cycle going I'll say how well my last watchlist did like I have been doing and hopefully this amazing streak will continue another day. I mean the streak of me picking four or five stocks and one of them is a top percentage gainer on one of the major exchanges. This has happened atleast three times out of the last seven trading sessions or so. I think the streak is two days back to back even too. ROIAK ran 60% just a couple days after I posted it I think. Last Sunday I posted up CMLS and it was a top percentage gainer on Monday. I Forgot the run? I think it was 30%. YONG was nice to. On Wednesday I posted on MMG and it ran 60% Thursday. On Thursday night I posted the set-up on Sunrise Senior Living SRZ and it ran 44% on Friday. The combined gain of Fridays watches was 69%. I don't think I mentioned it in a post but RAME a stock I put on my Twitter popped big double digits a day or two after I posted it a week back or so. I think there are others but anyway here are my top watches for Monday. My gold stock watch MMG from yesterday popped 60% today. I don't expect most of these to pop over 20% in one day soon but who knows. Net-Net FSII just broke out again and has some good technicals going for it. Most of these watches below are suited for a swing trade with the stop loss right below the trend lines or fairly loose. Ideally these might be good entries on slight pull-backs if they happen to come quick or on the next push up depending on the next move. This is a flu play. They sell point of care flu tests. I think EPS guidance maybe isn't taking fully into account the swine flu panic by offices ordering more product. I've talked about this baby boomer retirement play a lot in the past year. Very bullish chart. 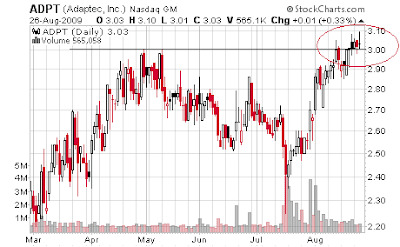 A watch for breakout from this trading range. You know the bulls are in control when consumer fashion apparel stocks like American Eagle AEO are breaking out on gaps on huge volume. No doubt retail sales results had a hand in this. It's the direction the market goes on the news that is important. Hey, so what if it is from 0% rates and trillions in stimulus. I'd be happy to long AEO on retest of gap about 17.40ish if it holds. It might just take off though tomorrow but I doubt it. It still would be a spec swing trade though. That was some list from yesterday. Chinese agriculture stocks like YONG must have all had a good day. YONG had the gap up and run I was looking for. CMLS was a top gainer today etc. Other watches were amazing like ROIAK I've had on watch ran 46%. This shorter trading list for the week wasn't quite as impressive as my hand picked watches. I'm not sure which scans to give my priority now. I'll probably continue to have a lot on my watchlists. I think using call options on some of my top set-ups might do really well. I think maybe there is a couple people interested in these watches, I don't know. I might put up new lists this week if I make any. Gold has just reached new highs of $1,043. I predicted the breakout on gold in early September and presented my thesis for anyone who reads the blog. Like I was looking for and said,"Any congestion would be bullish." Gold did congest around the former highs and that was the signal along with the triangle that telegraphed the move. Some gold stocks to buy possibly I am looking at for potential quick trades soon are as follows. The following list is stocks I have picked out solely because of their technical price action. This is a gold correlated stock list but they don't always mimic the price of gold. GRS had a breakout gap on volume. New Gold also had a gap on volume but it needs to hold $4.30 to look like a buy. Metalline Mining looks like it might be late to the party. Looks good on a technical breakout. Why buy gold stocks? Gold is a commodity that usually has an inverse correlation with the United States dollar. If the dollar falls because of inflation or hyperinflation its purchasing power thus falls and any safe haven for capital is attractive to invest in. This is why you would want to buy gold stocks. The last time the United States experienced hyperinflation was during the 1970s. Gold went on a tear and was a great investment vehicle during those times. More gold penny stocks for trades possibly. I used a new scan and found some pretty good stocks in play. Check out the volume spikes on these. TTNP from an earlier post is still one of my top watches. YONG hit the trend line 3 times and this last time somebody really showed their hand. Looks like a long on breakout. 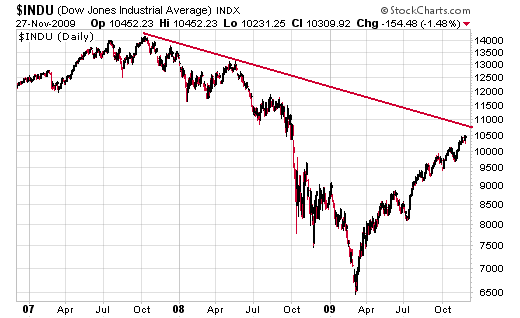 Might not retest that trend line anytime soon. There's no resistance on this chart to. into the research and development, manufacturing, and distribution of fulvic acid based liquid and powder nutrient compounds for plant and animal feed used in the agriculture industry in the People's Republic of China. You would imagine Chinese agriculture stocks doing pretty well in the future. They grew earnings per share 18% this year and are looking for 46% next year. EPS for next year is 1.00 per share and has just been boosted which is good. So we've only got a PE of 8 and very strong growth coming likely in the years ahead. The longer term PEG ratio is something like .30. Very attractive. The balance sheet is healthy with a current ratio of 3 and total debt to equity is just .47. The only thing I don't like about this stock is it is already up a ton this year. On the other hand the valuation should still look cheap to a lot of people. If you look closely at this chart and the next one you can see how usually every time it gaps up it runs. Let's keep an eye out for another gap breakout. Media company CMLS. Probably a set-up for a buy on breakout. I missed the two hammers back to back off trend line on flag. This volume spike looks pretty telling somebody will take it over resistance I think. Mining stock LVCA. Big volume on breakout. I think the spread will be decent and the chance of follow through on this move looks very good. Fundamentally the US dollar is weak. Technically, it is even more weak. As you probably know the dollar has been in a long-term down trend. 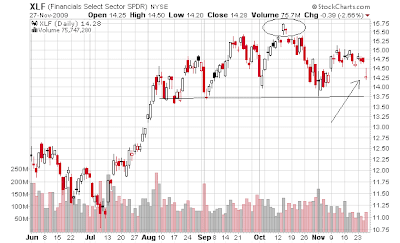 Well, on the last leg up it formed a double top and has been crashing ever since. PowerShares DB US Dollar Index Bearish (UDN) trades inverse to the dollar. It's a decent trading vehicle for short exposure as far as a stock goes. 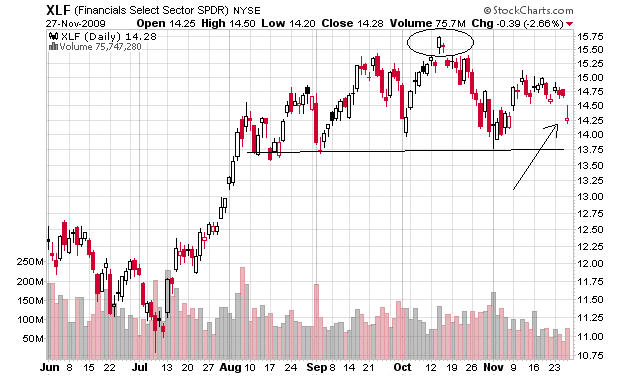 Keep in mind the chart below is the dollar short ETF. Click on it to enlarge it. There was recently a breakout gap to the downside. I feel very confident this ETF will test this resistance around 28.50s. I feel confident it will hit mid 29's probably 29.50 as well. So there is still some gain to be had if one was say looking for an addition to a diversified portfolio or swing trading account. I think there is still a good entry right now with a great re-load if there is any pull-back. I will be putting up more stock plays over the future as the dollar continues to weaken. I added a couple of stocks to my watchlist. I added ROIAK DANR TTNP. I put a conditional buy order in for DANR. If it hits $.19 I hope to get filled. TTNP looks like it might have a pop over $1.75 coming. TTNP couldn't go over $1.75 three times. Any pure funnymentals guys/gals. count it. Random chance or an emotional, important price level? Once it breaks over this resistance level I am betting it will be in play. I probably will put a conditional buy market order for $1.80 in here sometime before the market opens. The ascending triangle helps to. Almost always volatility after a triangle. I chickened out on my idea to short real-estate with SRS. I was spot on though on the further downside that seemed to be coming after the flag I was looking for to get short. I feel like going here with an ETF to short an index again. I like the volatility in SRS. It's prudent to wait though for more fundamental signals and technical breakdown though. So, I think I will. I think my valuation thesis makes sense and that as economic numbers will probably continue to show that this housing depression and economic recession are different than any in recent history. In other words it's hard to just get back to normal after a credit and housing bubble that lasted for many years. The only problem with a short trade for a couple days or so though I think is it could be possible that when the S&P and other indices finally correct a little the downside might be limited and they just trade sideways for weeks and months. I was surprised and glad to see that Ben Bernanke said that businesses must be allowed to fail. I don't think he has the right framework for stopping them from becoming systemic though. I haven't read or seen his whole presentation today but it seems like he just thinks if you raise capital requirements and regulate to big to fail can be avoided? He needs to study some history if he thinks investment banks and commercial banks can exist together without major consequences to the system. Long Term Capital Management should have failed in 1998. Breaking up these ridiculous giants like Wells Fargo and Bank of America is the kind of reform that can allow firms that leverage up to fail. There's a reason my 1907 crash paper is second in a Google search for '1907 crash' only to Wikipedia. I think our system is set up to fail now probably unfortunately though. I might post more on this as time goes by. Not sure if I should buy gold and silver bags or prepare for bartering when we can't afford these interest payments and/or they get raised. I've had an eye out for anything financial lately. Especially looking for the beginning of a new run. CSGH isn't a financial I don't think but it has a great chart going for it right now. Might just run again tomorrow. Great volume spike.If anyone else has some nicely uptrending financials or ones that just had unusual volume anytime in the future post them up with the ticker in a comment anytime. Unusual volume spikes are great scans. I recently caught BRNC with one at a 5 handle and it ran to $7. CNBC did atleast one long segment on APT this morning as part of a swine flu segment. Here is the CNBC article on them to. This $130 million market cap company had heavy volume today on a gap up. I'm going to watch for a possible double top. It looks like the chart sets up for a short if it fills this gap. The chart is unclear to me until it retests that high. It very well could continue breaking out though because of this gap and volume. Though the past two times is has a gaped up it has pulled back immediately this year. 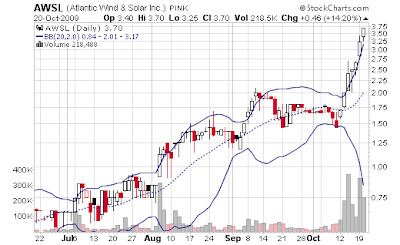 I put CHCI up as a watch the other day and this thing ran huge today and topped out at $.98. I didn't trade today but I hope some of you maybe saw these like VG to that I put on Twitter that ran today. LPTH was my top watch today and it ran 16% today off a easy set-up. The breakout was at $2.30 and it ran to $2.74. Net-Net MSN is holding up better than I expected. To many possible swing trades out there. ADPT is testing around this new possible support around $3.00. It is congesting well so far which makes it seem that it might continue running. If I'm going to play it tomorrow is the day to go long. I think a good stop loss is right below $2.85. If you look on the 11th,12th and 18th $2.85 was the low of those days and important support. The likelyhood of it getting more downside when it cracks this is pretty good. So $2.83-84 is a good stop point with a profit target of $3.50-.60. EF Johnson Technologies EFJIMost of their business is from wireless radios. They sell wireless communications equipment with a large base of their customers being the government. The U.S. Department of Defense was approximately 15%, 62% and 16% of consolidated revenues in 2008, 2007 and 2006. DRS Technologies, Sprint/Nextel, and the State of California are significant customers, representing 13%, 12% and 12%, respectively, of consolidated revenues in 2008. At $1.24 a share market cap is $32.74 mil and net current asset value is $39.41 mil. Net current asset valuation is a quick rough liquidation value. However, in this particular case almost 50% of NCAV (net current asset value) is comprised of inventory sitting in storage. In the event of an actual hypothetical liquidation it would very likely yield much less than the amount on the companies books. 2009 earnings per share have been boosted it appears to $.06 and a sole analyst expects $.10 for 2010. At 1.24 a share this is only about 12 times earnings and they could continue to grow over 50%. This asset valuation and trailing 2009 PE multiple of 20 seem nuts to me. Nuts meaning it might still be undervalued. On the 15th of September volume soared and the stock flew on the back of a press release for their new Hybrid IP25 first responder radio system and 2 new military contracts for the radios on the 15th. I would have loved this stock at $1.00 because of the larger asset valuation cushion and also because of the price action. I believe the stock could have a pull-back soon which I explain in the following charts and I am going to wait a day or two to see what develops. In the above chart we can see that there could be strong support right around $1.00. It's running on heavy momo(momentum) right now being that it is hugging the upper band. Some people could take some profits soon. The arrow on the right shows how buying volume is trending downward day to day which worries me that buyers might be getting exhausted in this round up for now atleast. Plus the doji candle two days ago and a shooting star candle Friday. The momo could very well continue for awhile but I feel more comfortable waiting just a day or two for either a pull-back or some other sign buyers are committed right now. I haven't traded any of those ETF's like I was thinking about like SRS or a short on the Nasdaq. This market continues to be incredible as far as the confidence in equities even with higher valuations. I'm not going to short any indices soon. I put this momentum penny stock KEME at the top of my watchlist the other day and ended up longing it at an average basis of $1.48 a share. It failed to breakout then has just seemingly re-tested and printed a hammer today. I'm looking for a breakout to sell into and add to my 7% profit so far. If it gets hung up again on the breakout and doesn't look strong I'll probably take the gain or cut it break-even to slightly down. This hammer looks really good to me though.